Registration Fee: $45 per contestant (includes entry to Sugarplum Marketplace for 1 contestant and 1 parent). Sugarplum Spirit Award – optional – awarded to the contestant who sells the most Sugarplum Marketplace tickets prior to 29 November 2018. No one other than contestants (and 1 parent, if necessary) or pageant staff will be allowed backstage or in changing room. No one other than contestants (and 1 parent, if necessary) or pageant staff will be present at optional walk-through rehearsal (day and time to be announced later). This is a natural pageant. No flippers or hairpieces allowed. Make-up must be age appropriate. No professional hair or make-up personnel allowed. Arrive mostly ready. Changing room will be available but will have tables and chairs only. Personal belongings must be removed from changing room after completion of age division. Contestant and 1 parent must enter through Pageant Check-in and sign-in. All other family members and friends must enter through Sugarplum Marketplace front entrance. Doors open at 9 am. Admission for the pageant/Sugarplum is $8 in advance if purchased through the Junior League of the Shoals or $10 at the door. Each contestant will have the opportunity to sell tickets in advance for the special rate of $5 per ticket. The contestant who sells the most tickets will receive the Sugarplum Spirit Award. Friends and family members who do not buy a ticket in advance from either a contestant or the Junior League will have to pay $10 at the door. No exceptions. 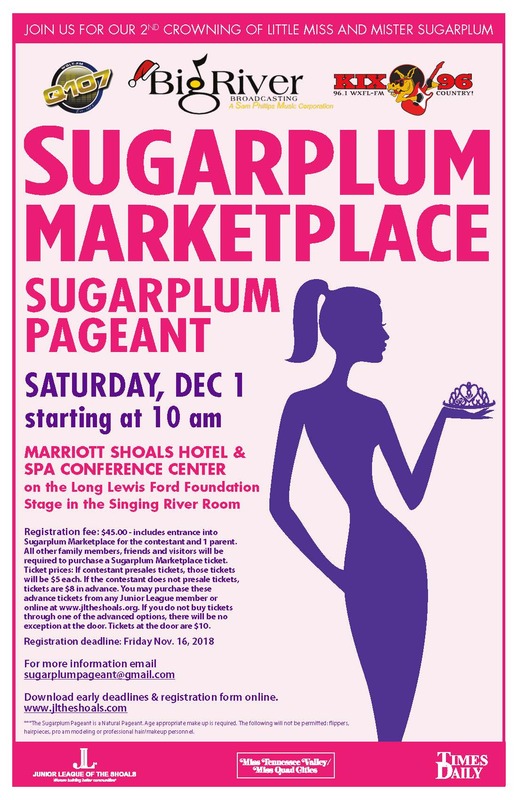 Because this pageant takes place within Sugarplum Marketplace, any undignified behavior may result in disqualification and/or removal from Sugarplum Marketplace. A confirmation email will be sent to each registered contestant/parent the week of 5 November 2018. This email will contain information on age division check-in times, practice times, start time for each division, etc. 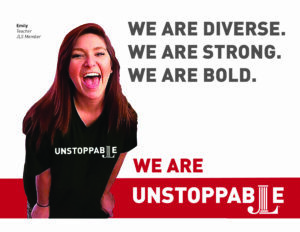 Junior League of the Shoals, the Sugarplum Marketplace Committee, The Marriott Hotel and Spa and the pageant committee will not be held liable for any damages that may occur to a contestant’s pageant apparel, accessories, or personal belongings during the competition or competition activities.